The Big Horn No. 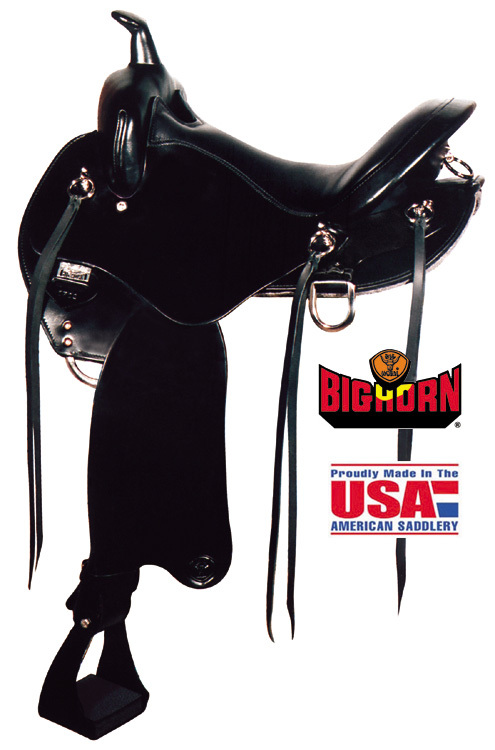 A01702 will give you the best of a walking horse saddle with the comfort of a trail saddle with dual density memory foam padding. Tree: Big Horn flexible tree, with exclusively designed Walking Horse bars. Rigging: Double, stainless steel. Dropped D.
Skirts: 24" x 14", lined with 1/2" wool felt. Fenders: 19" x 8", 2 1/2" stirrup leathers with stainless steel buckles. Stirrups: Aluminum, rubber padded endurance strirrups. Trim: Nickel hardware with saddle strings. Wool felt skirt lining offers natural shock absorbtion, padding, and moisture absorption.